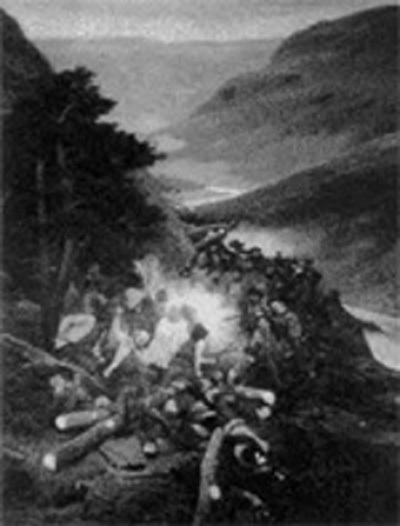 This a Norwegian song about the massacre of Scots mercenaries hired by the Swedish king in a war with Norway and Denmark. 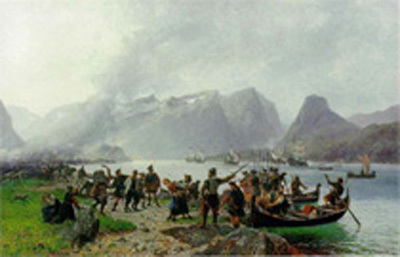 Colonel Alexander Ramsay and his men landed at Isfjorden, on the coast of Romsdal and Møre, and were ambushed by Norwegian farmers at Kringen in the Gudbrandsdalen valley on 26 August 1612. Many of the Scots were slaughtered, among them Captain George Sinclair of Stirkoke, who led the Caithness Company. Tradition has it that he was shot by Berdon Segelstad with a bullet melted from a silver button. The place where he fell was marked with a wooden cross, and a commemorative plaque added in 1733. This lasted until an Englishman shot it to pieces with his pistol. A stone memorial was erected at the same spot on the 300th anniversary in 1912. There is a street named after Sinclair in Otta. ‘Zinklars vise’ was written in 1781 by the Norwegian poet Edvard Storm (1749-94). Very little of his work has been published in English, so this version has been specially translated for our website by Louis Mackay (translator of Gerd Brantenberg’s The Daughters of Egalia), with help from some friends. Not all the words have simple English equivalents: ‘Herr Zinklar’, for example, means something between ‘Mr Sinclair’ and ‘Sir Sinclair’, so the translators decided that Lord Sinclair would work best. Interestingly, the original poem doesn’t refer to Sinclair as Captain Sinclair, just ‘Herr Zinklar’. The ballad has been sung by several Norwegian groups: a traditional folk version by the 1970s group Folque, and a Viking metal version by Týr (2008). It was also sung by Gny at the Midvinterfestival, Den Grå Hal, Christiania, 2008. ‘Led er din Sang’ was composed by Kristian Blak and is sung here by the Faroese singer, Eivør Pálsdóttir, with kind permission (Yggdrasil: Tutl, HJF 88). You can also listen to ‘The Moorlough Shore’, sung by Sinéad O’Connor, referring to Sinclairs in County Tyrone, Ireland. Where a bloody brow awaited. They’re coming across the heath. The turf of Norway bite. She bode Lord Sinclair ill. Turn back! Turn back, you Scottish man! Wicked, your song, you poisonous troll! I’ll hack you limb from limb. They scorned the weeping widow. To the heart of the nation travelled. As Lord Sinclair must avow. Who’d now his blood conserve! With the Scot, they would have words. There the foe would fall. And longingly awaits his spoil. The first shot did Lord Sinclair strike. God free us from this woe! Forward, farmers! Norwegian men, Advance! Strike down, strike down and slaughter them! His lust for battle gone. Who dwell among Norway’s hills. That Norway’s foes would threaten. Each time his eyes behold it! Adolph Tidemand/Morten Müller: “Sinclairs landing i Romsdal” (1976). Reproduced courtesy of Sinclair’s Club of Otta. 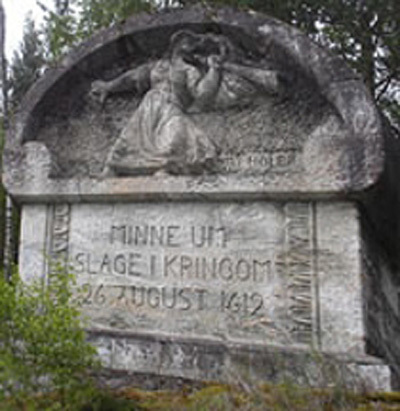 The Kringen Memorial. Reproduced courtesy of Per-2-Peer. Georg Nielsen Strømdal: “Slaget ved Kringen”. Reproduced courtesy of Sinclair’s Club of Otta.